I’m fascinated with Roman history. Understanding this period helps me to understand both how the Western world has been shaped and what the conditions were like for the birth and expansion of Christianity. Nearly every Emperor of Rome demanded god-like devotion. “Kaiser Ho Kurios!” (Caesar is Lord!) was a statement of Emperor devotion demanded from the citizens and non-citizens at the time. Non-compliance could have resulted in swift execution. Roman Emperors were not the only ones to self-deify themselves. In the Book of Daniel we read that Nebuchadnezzar then Darius did the same. Of course the Romans believed in a Pantheon of gods – Zeus, Hermes, Mars, Jupiter, Hercules, and so on (note Acts 14:12-13 ). Not surprisingly, most the Caesars who self-deified themselves were either assassinated by someone close to them, or (as in the case of Nero) invited to commit suicide. Apparently claiming to be a god, when you are not, tends to infuriate those around you. Which is why Jesus stands out as unique among those who claimed to be God. His crucifixion reveals that He certainly infuriated some who did not know Him, but among those who did know Him, their response to His claim to Deity was worship and devotion – even from His brothers! 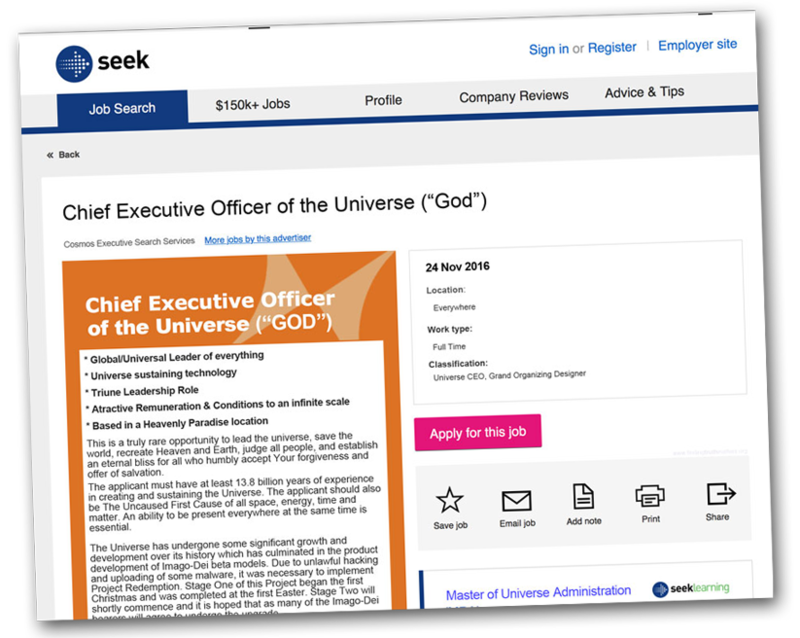 So just who does God think He is? 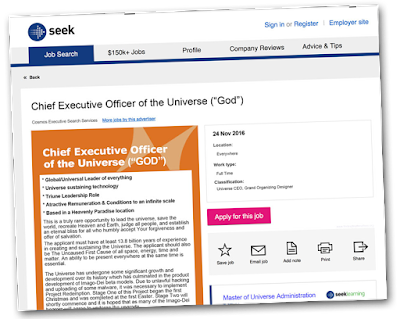 If, for some impossible reason, the position for “God” became vacant, what might the job description look like? Being a Judge would definitely be listed. Judging is a god-like activity, and the God of the Universe would have to be the Ultimate Judge of that Universe. We note that the Psalmist contrasts god-like deputies with God, for, unlike God, these human deputies who perform a God-like function (judging) will themselves be judged and eventually die. Jesus cited this passage in John 10:34 . His point is similar, sometimes human beings deputise for God and identified as fulfilling the God-role of ‘judge’, but His claim to deity goes further because He claimed that He would not be subject to the finality of death like mere mortals. God is the only person truly qualified to perfectly judge each person. Each one of us will stand before this perfect Judge and give an account of our lives. ¶ Then I saw a great white throne and him who was seated on it. From His presence earth and sky fled away, and no place was found for them. And I saw the dead, great and small, standing before the throne, and books were opened. Then another book was opened, which is the book of life. And the dead were judged by what was written in the books, according to what they had done. God’s authority to judge is grounded in His claim to be Creator. Since this world is His, He alone has the right to decree how people should conduct themselves. The Bible also refers to those who serve God as being His “sons”. In this light, many scholars believe that the ‘sons of God’ referred to in Genesis 6:2-4 is describing fallen angels who were created to serve God. While angels do not ordinarily have corporeal (physical) bodies like humans, the Scriptures leave room for the possibility that it is at least possible for an angel to take on a human form and carry out human functions such as eating and therefore (possibly) sexual activity (note Hebrews 13:2 ). This might explain why the offspring of this activity mentioned in Genesis 6 were born as giants. The designation of ‘sons of God’ is to be distinguished from the Son of God. Even under the Old Covenant period there was a growing knowledge that God had a Son (Proverbs 30:4 ) and by the time of the New Covenant this revelation is stated clearly in John 3:16 when it describes Him as God’s only Son. It was during the proceedings of the Nicene Church Council around 325AD when Athanasius identified Christ as the eternal (no beginning, no end) Son of God, since God the Father is described as the Eternal Father (did not begin to be a Father and will never cease being a Father). Thus, since God is the Eternal Father, He must have always had an Eternal Son. Therefore, the Council reasoned, Jesus is the Co-Eternal, Co-Equal, Co-Immutable, Son of God. The New Testament reveals that God adopts each one who turns to Him for salvation. Jesus described the love of His Father in the story of the Prodigal Son. The father not only forgives the humble seeker of his forgiveness, he celebrates his return and declares him to be his son with full inheritance rights! Who does God think He is? He declares Himself to be Creator, the Law-giver, Judge, Father, and Saviour. He has founded the Church as His agency for declaring to the world who He is, what His will is, to warn them of His certain judgment, to invite them to return to Him as their Father and Saviour. For those who have the eyes of their hearts opened to this amazing grace, their hearts begin to crave His holiness and their lives begin to reflect His godliness. As President Abraham Lincoln said, “You can’t trust everything you read on the internet!” Therefore, I’m not sure whether Bill Gates actually did say it or not, but the claim is made that he once said, “I always choose for a lazy person to do a difficult job. Because he will find an easy way to do it!” This contrasts with the different approach, “If you want something done, ask a busy person to do it!” The question therefore is: Which is better?The lazy approach or the busy approach? ¶ Lazy people consider themselves smarter than seven wise counselors. While Bill Gates may assume that lazy people are incredibly smart people, I think they also deserve another compliment. Lazy people are often energetic people as well. In fact, many lazy people are so energetic, they can look downright busy! It is wrong to assume that all lazy people are inactive people. They can be very energetic. Laziness is thus not necessarily about the amount effort or activity involved. For example, riding a horse requires effort and can be a very effective means of transport. But not if the horse is a rocking horse! This is despite the effort involved to ride a rocking horse possibly being even more intense than riding an actual horse! Some very active and energetic people get quite offended if they are accused of being lazy. Conversely though, we shouldn’t assume that the person doing nothing is necessarily a lazy person either. Feel it no shame, at proper times, to be doing nothing. Laziness has more to do with a lack of effectiveness and appropriateness. Someone may be busy trying to scale a wall using a ladder. They may build a ladder, move it into position, test it, and vigorously go up and down it. But if it is the wrong type of ladder, or the wrong size ladder, or worse still, the wrong wall – they are being lazy, despite their hard work and busyness! Diligence, not busyness, is the opposite of laziness. Diligence strives for effectiveness and appropriateness. This requires self-discipline and persistence. It does what must be done – what has to be done – even when we are tired, afraid, uncomfortable, or uninformed. Laziness is rarely prepared to make sacrifices in order to be effective. Diligence nearly always, if not always, involves having to make sacrifices. I know many good people who all work very hard, but don’t seem to be very effective. They always seem to be running out of time. They are forever misplacing things. Their solution would be to relearn how they do everything. Diligence is therefore not merely a matter of working as long and as hard as they can. Rather, it is finding out the best way to do something then working as hard as possible to do that. So which is better: lazy or busy? If someone is considered ‘lazy’ simply because they are not busy, when in fact it is merely because they are efficient and effective (and consequently have time to do nothing), this type of lazy would be better. But if someone was ‘busy’ (and also efficient and effective), it may simply be that they are in a season of demand whereby they are helping many others. In such circumstances, busy is better. And translating this stand-off into the spiritual arena we can soon see that spiritual depth comes from resting in the finished work of Christ for our salvation. In this sense, we are saved by works – it’s just that it’s not our own, but Christ’s. Yet diligence and hard-work is also required for spiritual depth. The Apostle Peter told believers that they needed to be diligent to be found in Christ (refer to 1Peter 1:10), and the Apostle Paul told the Corinthians that they needed to work diligently to continually be beholding Christ (2Cor. 3:18). ¶ Therefore, beloved, since you are waiting for these, be diligent to be found by Him without spot or blemish, and at peace. This kind of diligence is the same as other forms of diligence. It strives for effectiveness (Philemon 6) and giving appropriate glory to God. It’s the kind of diligence which makes sacrifices in order to practice the spiritual disciplines which are deepening for a soul and glorifying to God (daily Bible reading, prayer journaling, witnessing, Sunday worship, fasting, giving, and contemplation). This is better. It has been said that the thing which makes Christianity unique in comparison with other faiths is that it is a relationship rather than a religion. This is at least true. It is indeed a relationship between the redeemed and the Redeemer. But its beauty goes still deeper. This depth is wrought by the Holy Spirit in, on, through and around the redeemed. His redeeming work of captivating, convicting, converting, transforming, and commissioning the ransomed-redeemed of the Lord begins before it is too late. The Holy Spirit Himself, who (along with the Father and Son) uniquely possesses omnipresence, is mysteriously able to draw alongside an individual rebel and patiently woo their rebellious heart away from religion toward a relationship with the Jesus – and then take them deeper into the beauty of Christ. When this wooing was felt by C.S. Lewis in the Trinity Semester of 1931, he described himself as, “The most dejected, reluctant convert in all England!” However, not everyone experiences such a spiritual conquering. F.W. Boreham for example, was raised in a church-going family, but had not experienced the Holy Spirit’s redeeming transformation until around 1890. Like Lewis, he came to the realisation that his religious efforts were grossly inadequate to qualify his soul for acceptance by God. He turned to the Saviour, was baptised, then received the laying-on-of-hands with the prayerful injunction to receive the Holy Spirit. F.W. Boreham suddenly experienced an infilling with the Holy Spirit which he said resulted in his inability to feel the ground beneath his feet for the next week or two! It appears that he was baptised with the Holy Spirit subsequent to his conversion to Christ. He, of course, is not the only one who has experienced the promised baptism with the Holy Spirit subsequent to their conversion from rebellion to redemption. Millions of the Christ-redeemed have then also experienced an overwhelming of spiritual awareness and presence which has opened them up to a realm of supernatural gifts, phenomena, and intimacy with Christ. This has then introduced these followers of Christ to a deeper, richer, closer, sweeter walk with their Lord. Have you experienced this in your relationship with Jesus? ¶ “But when the Helper comes, whom I will send to you from the Father, the Spirit of truth, who proceeds from the Father, he will bear witness about me. The Spirit’s work of conversion in the rebel begins with conviction of sin (John 16:8). A lingering sense of guilt and shame is a sure sign that the Holy Spirit is active in a soul. By His persistent grace He woos and drives the rebel to accept God’s gracious offer of forgiveness, soul-cleansing, and adoption. Upon acceptance of God’s love and grace, the Holy Spirit converts the rebel into a born-again follower of Christ. Too many people have been lulled – nay, duped – by certain socialising pressures (perhaps family upbringing and church tradition) into thinking that Christianity is merely about behaving like a Christian – attending church, owning a Bible, giving to charity. But unless a person has experienced the inner work of conversion by the Holy Spirit, they are not yet a Christian. It is at this point that the converted rebel realises that Christ substituted Himself for them and bore their penalty of their divine rebellion. Have you been born-again by the Holy Spirit? ‘Sanctification’ means to make holy, separate from the ordinary. The work of the Holy Spirit does not cease upon the conversion of the rebel into the redeemed. Although, in the eyes of God, the redeemed rebel is perfectly sanctified upon their conversion, there is still an earthly process of sanctification. This process puts to death those rebel-qualities of self-centredness and brings to life those Christlike traits of service to others. I am speaking in human terms, because of your natural limitations. For just as you once presented your members as slaves to impurity and to lawlessness leading to more lawlessness, so now present your members as slaves to righteousness leading to sanctification. But now that you have been set free from sin and have become slaves of God, the fruit you get leads to sanctification and its end, eternal life. The external fruit of sanctification is seen in how we speak, use our time, money and talent, relate to others, and is rooted in the innerwork of the Holy Spirit transforming the rebel into the redeemed. How has the Holy Spirit sanctified you since your conversion? After Christ had atoned for sin, He breathed on His disciples and commanded them to receive the Holy Spirit (Jn. 20:22) and then told them to wait for this Promised infilling with the Spirit (Acts 1:4). When the Promised baptism with the Holy Spirit began on the Day of Pentecost, the believers began to prophesy and/or speak in tongues (Acts 2:6). The Apostle Paul would later write that speaking and praying in tongues served different purposes. Speaking in tongues, with associated gift of interpretation, was equivalent to prophecy (1Cor. 14:3), whereas praying in tongues required no interpretation because it was speaking to God (not people) (1Cor. 14:2). The Apostle also revealed that tongues (unlearned languages) could be a language of men or a language of angels (1Cor. 13:1). When speaking to God in tongues, this form of praying is able to edify the believer (1Cor. 14:4) and build them up. One of the nine mentioned gifts of the Holy Spirit is also a type of tongues. It appears that this type of tongue is the aforementioned equivalent to prophesying. Jesus said that He would send the Holy Spirit to comfort, counsel, guide, strengthen, and empower. He said that when His followers would be baptised with the Holy Spirit, they would be empowered to witness about and proclaim Christ and His Gospel. We see on the Day of Pentecost (Acts 2), that the previously timid, awkward, inarticulate, Apostle Peter was transformed into a bold, courageous, passionate, persuasive and articulate herald of the Gospel of Christ’s Kingdom (Acts 2:14). Our fellowship with the Holy Spirit distinguishes Christianity from mere religion. The redeemed’ fellowship with the Holy Spirit is what makes Christianity a living, vibrant, relationship with Christ. It involves the illumination of God’s Word, the reception of God’s voice in the hearts of the redeemed, the leading of the Spirit into wise choices, supernatural empowering to speak and bear witness to Christ’s Lordship, and a continual sense of God’s loving overshadowing presence. Don’t treat your Christianity as a mere religion. Instead, let us realise what it actually is – the Spirit-filled life! Let us grow in our life in the Holy Spirit, and continue to go deeper and sweeter with Christ in our knowledge, character and choices. HAVE WE LOST OUR SENSE OF THE SACRED? In the West, unlike the East, we suffer the enormous disadvantage of living in a culture largely unfamiliar with the sacred. Added to this, there has arisen an understanding among contemporary Christians that there is no warrant for making any distinction between ‘the holy’ and ‘secular’. But rather than regarding everything as holy it has tended to mean that everything which was once holy is now regarded as ordinary (‘secular’). This then leads to certain sacred rituals of Christianity being trifled with (treated as less important than they are). When this happens, the Christ-instituted rituals of Christianity are misrepresented and therefore misunderstood, which in turn, diminishes people’s vision of God’s glory. Let’s rethink rituals. ¶ And on that day there shall be inscribed on the bells of the horses, “Holy to the LORD.” And the pots in the house of the LORD shall be as the bowls before the altar. And every pot in Jerusalem and Judah shall be holy to the LORD of hosts, so that all who sacrifice may come and take of them and boil the meat of the sacrifice in them. And there shall no longer be a trader in the house of the LORD of hosts on that day. RITUALS OR SACRAMENTS OR ORDINANCES? Rituals can be lifeless. Especially when they are not understood. All of the rituals of Christianity are opulently rich in meaning. Some traditions of the Church refer to these rituals as sacraments. The word ‘sacrament’ comes from the Latin word for mystery, “sacer”. It has generally come to mean the outward expression of an inner grace. That is, by performing the ritual, God’s grace is mediated to its participants. The traditions of the Church which have regarded certain Christian rituals as sacraments have necessarily required that those who minister them are consecrated to do so. These people are known as priests. The belief that some people can be consecrated as priests and then minister the sacraments is known as sacerdotalism. The Reformers, beginning with Martin Luther (1483-1546) in 1517, began to raise objections to the idea of sacerdotalism. Initially, these Reformers merely de-classified some of the 7 sacraments (Baptism, Confirmation or Chrismation, Eucharist, Penance, Anointing of the Sick, Holy Orders, and Matrimony) down to just 4 (Baptism, Communion, Holy Orders, and Matrimony). Then these 4 were reduced to 3 (Baptism, Communion, and Matrimony), and ultimately to just two (Baptism, and, Matrimony). From this point, Communion became regarded as as Ordinance rather than as a Sacrament by most Protestants. It was the Swiss Reformer, Ulrich Zwingli, who first challenged the notion of Communion (“the Eucharist“) as a sacrament. He argued that it was not a sacrament because the elements were merely representationsof the Lord’s body and blood. This was different to the Roman Catholic position which taught that the elements (which they call accidents) are mystically transformed into the actual body and blood of Christ. This view is known as Transubstantiation. It also disagreed with Martin Luther’s modified position about Communion. Luther also disagreed with the Roman Catholic position but taught that Christ was with the elements of Communion. This Lutheran view is known as Consubstantiation. John Calvin disagreed with Zwingli and argued that the Communion elements were more than mere representation of Christ’s body and blood, but he too disagreed with the Roman Catholic and views. He coined the expression Ordinanceand taught that the Communion should only be administered by an authorised (‘ordained’) minister. Many Protestants now hold to a Neo-Zwinglian view of Communion. They regard the elements of Communion as typifying the body and blood of Christ but having deep significance for all who partake. While not considering it to be a ‘Sacrament’ (which in itself imparts some grace to the participant) they do consider it to be mysterious. They argue that the emblems (or “elements”) of the Holy Communion were consecrated by Christ. The act of sharing and then consuming these elements was also consecrated by Christ. The significance of both the nature of the elements (unleavened bread typifying the sinless body of Christ, and the unfermented wine typifying the uncorrupted life of Christ) and how they are shared and consumed (the pieces of bread being broken from one unleavened loaf typifying that the participants are one in Christ, and the wine coming from one source typifying that there is only one Saviour). The mystery of this rite (or, ritual) is that if it is done in an unappreciative manner, there can be grave consequences (note the Apostle’s reminder to the Corinthians about this in First Corinthians 11). The celebration of Holy Communion is therefore a sacred moment. ¶ Now I commend you because you remember me in everything and maintain the traditions even as I delivered them to you. The word ‘sacred’ means set apart from the ordinary. It is distinct from ‘secular’ which means ordinary, common (even though most understand ‘secular’ to mean irreligious or non-religious). In this sense, Holy Communion is sacred. Its occasion, its elements, its means of sharing together, and what it typifies, are not to be trifled with. Dr. Sproul’s rebuke to his young theological student was therefore not the rankings of some out-of-touch theological dinosaur. The mystery 0f Holy Communion transcends time and culture. When Jesus said, “take eat” He was intersecting the present. When He said “in remembrance of Me” He was intersecting the past. Then when He said, “until I come”, He was intersecting the future. Thus, the practice of Holy Communion has past, present, and future implications. It speaks of what the Lord Jesus has done (by saving us), is doing among us (by knitting us together into a body of believers who experience supernatural unity in Christ with our fellow brothers and sisters, which requires “discerning” each time we partake, refer to 1Cor. 11:27) and will do when we all experience the fullness of our salvation in the eternal state which the Book of Revelation described as a glorious ‘supper’ together in Heaven. This is why it is extremely inappropriate for non-believers or non-covenantal-believers (those who believe in Christ and the Gospel, but have not sealed their covenantal relationship with Christ through the waters of believers’ baptism). This is why none of my children were permitted to partake in Holy Communion until they had entered into the covenantal waters of baptism. It’s also the reason we take Holy Communion out of our monthly Guest Service. ¶ For I received from the Lord what I also delivered to you, that the Lord Jesus on the night when he was betrayed took bread, and when he had given thanks, he broke it, and said, “This is my body, which is for you. Do this in remembrance of me.” In the same way also he took the cup, after supper, saying, “This cup is the new covenant in my blood. Do this, as often as you drink it, in remembrance of me.” For as often as you eat this bread and drink the cup, you proclaim the Lord’s death until he comes. Water Baptism or Holy Communion does not save its participants from eternal damnation. But both of them typify aspects of the work of Christ with great precision. This is why neither should be trivialized or trifled with. Time prevents me from elaborating on the third of ordinances, Holy Matrimony, and discussing its rich typifying of what it means to follow Christ and become one with Him. But if more believers did understand this, they might appreciate why the Enemy is so keen to undermine it in the eyes of the world.